Home / Blog / Blessing Israel / Sponsor our King’s Valley Project! We at My Olive Tree are so very thankful that we have people who continue to ask us how they can support our work in Israel. Now, we have a project in King’s Valley that allows you a chance to contribute in a new way—through sponsoring wheat and barley. For only $19.9 7, you can sponsor our wheat and barley growth throughout our trees that are planted in the King’s Valley. 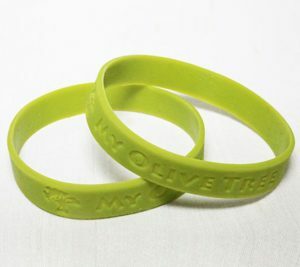 With your sponsorship, we will send you a My Olive Tree bracelet that sends the message that you are standing with Israel and with My Olive Tree. This is a basic, inexpensive way to support some great work that is being done in the Holy Land to reclaim the desert and provide Israeli citizens with jobs in the field of agriculture. The other way you can get involved is a larger commitment, but also a tremendous opportunity. We have 700 saplings that need to be sponsored. Whether they are olive, pomegranate, date palm or fig trees, sponsoring a tree is a lifetime gift that costs only a one-time donation of $187. For your support in sponsoring a tree for $187, we want to send you something in return. We will send you a certificate of authenticity that you can frame in your home or office. 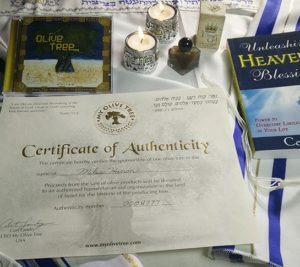 This certificate identifies you as a sponsor of a My Olive Tree, tree and provides you with the exact location of your sponsored tree in Israel. We also will send you a bottle of The King’s Oil, anointing oil, made from My Olive Tree’s olives in Israel. We will also send you Sean Spicer’s, Olive Tree CD—beautiful instrumental guitar music perfect for meditation in prayer. Shabbat Candles are another gift we provide to our donors, as well as Pastor Randy Caldwell’s book Unleashing Heaven’s Blessings. If you’re looking for an even larger commitment, we have 300 mature olive trees that can be sponsored for $500 each. For this sponsorship, we will send you a certificate of authenticity, and a beautiful seven species Tallit made in Israel. Finally, you have the opportunity to sponsor a 30-40-year-old tree for $1,495. With this option, we use a tractor or crane to transplant these amazing, mature trees to where it is ensured that they last long into the future and continue to bear fruit. For your gift, we will send you a certificate of authenticity, a photo of your tree, the GPS coordinates of your tree, and a bottle of My Olive Tree’s, Extra Virgin Olive Oil. And, you will also be pleased to know that your name, or the name of your organization, or a name in memory of a loved one, will be placed on a plaque at the base of the tree that you sponsor! This is just a preview of the first phase of our project, and we hope to expand to phase two with your support. Please consider taking a step to help restore the Garden of the Kings, and further our work in Israel.